A True Multilingual Internet Starts with Universal Acceptance | Constellation Research Inc. I was on a briefing call earlier this week with ICANN board member and CTO of Afilias Ram Mohan about the need for the technology industry to adopt Universal Acceptance (UA) standards for websites and email domain extensions. UA is defined as a technical compliance process that ensures that all domain names and email addresses can be used by all internet-enabled applications, devices, and systems. Simply put, UA is the ability to have domain name extensions in local languages beyond today’s ASCII and latin based characters, especially important in this age of globalization. An example would be “.photography” and “.рф” for “Russia” in the Cyrillic script or “.info" and “.訊息" in Chinese. Our universe of available domains under the current two to three character limits is shrinking, and many companies are making naming decisions based on one key criterion - is the domain name available? UA opens up additional opportunities to expand into branded in-language domains; particularly helpful to global Chief Marketing Officers (CMO) who owns their organization’s list of domains as part of branding. There are precedents for web standards such as the World Wide Web Consortium or W3C. 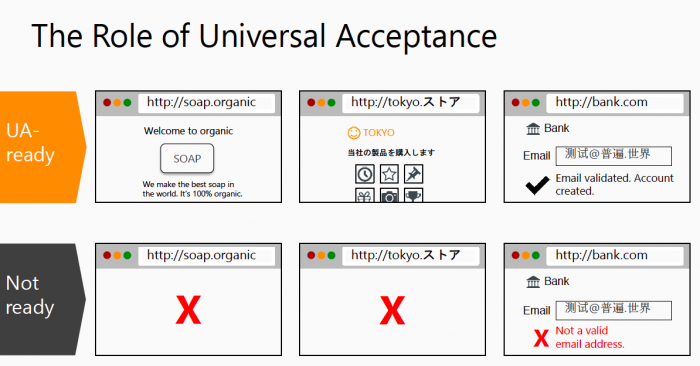 The goal is to have Universal Acceptance become a web standard in the future. According to Ram, over 120 global organizations including Apple, Google, GoDaddy, Microsoft and more, are currently engaged with the UASG. I also recommend the CRM, sales, marketing, and commerce solution providers to look into and plan for UA compliance as well. More information on Universal Acceptance can be found at https://uasg.tech.